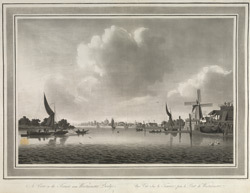 View of the River Thames near Westminster Bridge, showing boat traffic on the River and some windmills and other buildings along the banks. For centuries there was no bridge at Westminster, and by the 18th century traffic had to use a waterman, the horse ferry, or go around London Bridge or Putney Bridge. However this was inadequate by this time as Westminster had grown so much. The bridge was started in 1738 and opened in 1750.